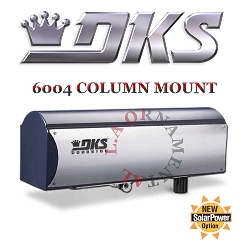 The 6004 Column Mount operates on 24 Volt DC power and features built in limit switches that precisely control the start / stop speed, and travel of your gate. The microprocessor based electronic control board provides many advanced features typically not found in operators in this class. The control box can be powered by 120 Volt AC, which is then converted to 24 Volt DC to power the actuator and control board. Two 120 Volt control boxes are available to choose from, Deluxe and Standard. The Deluxe control box includes three 120 VAC outlets to power accessory transformers. Both include 3.5 Ah (Amp Hour) batteries for back-up power operation. You can also select our Solar Powered control box, which eliminates the need for high voltage power runs. Maximum gate weight 300 lbs. Dimensions (operator only): 5.13"D x 5.25"H x 16"L.
Actuator main arm: 17.5" in length, with a total Height of 6.5" including the arm drive bolt.